Hand-hooked wool creations in primitive, nautical and traditional designs. As far as we know, we invented these colorful enhancements for the table. Our trivet surrounds are hooked original designs that encircle sturdy cork inserts suitable for use as hot pads, coasters, serving trays, even under houseplants. As with all our work, the foundation fabric is long-lasting burlap. The base (except where noted) is thick felt, hand-stitched to the canvas, creating a soft pad to protect your delicate surfaces. Trivet surrounds come in two sizes: 9" diameter (small) with a 3.75" cork center, and 12" diameter (large) with a 6" cork center. Off Soundings Design uses only the finest quality cork insert in its trivet surrounds. This removable cork insert, known on the market as ProtectoMat®, is earth-friendly, completely washable, and carries a full five-year guarantee from the Walton Company of Huntington Beach, CA. It will protect your table surface from moisture, burns and scorches, mold and mildew. With the cork insert snugly in place, our trivet surrounds may be used under hot casseroles, dewy pitchers of iced tea, and even the potted geranium in your window. 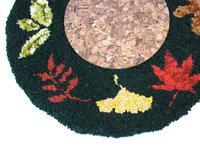 Our trivet designs are available in seasonal, primitive, traditional and even contemporary patterns. If you don't see something to suit your needs, consider a custom order. We can create a trivet surround to complement your china pattern or your home's color scheme. 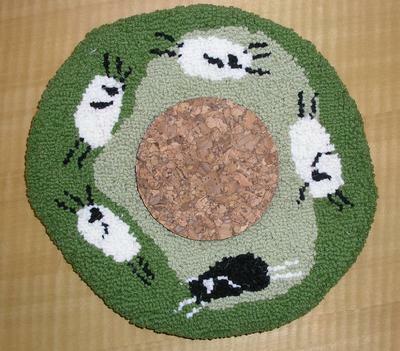 We can even match the design elements to one of our tea cozies. Custom ordering costs you no more than our ready-made items. Because each design is unique, everything we make is "custom." Normally our large trivet surrounds are 12" in diameter, but this one got away from us and grew to 13" while we weren't looking! Our decorative and sturdy table runners are a great way to dress up a table or sideboard. Backed in thick felt, they provide a soft, moisture- and heat-absorbing pad for your delicate surfaces while still adding some style (and dare we say whimsy?) to your table. With our Sunflower Table Runner we used the deepest, darkest green wool we could find for the background and added a subtle vine-and-leaf motif to run among the variety of sunflowers. Each sunflower is different, utilizing a mix of single color wools and over-dyed wools for more visual interest. The backing material is a thick black felt, hand-stitched to the canvas. The Holly and Ivy Table Runner offers a soft, mossy sea green background (one of our favorite colors, but so difficult to photograph accurately!) with a twisting garland of dark green holly around the perimeter. 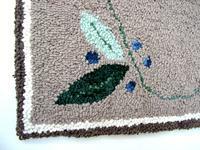 The holly berries are hooked with over-dyed deep crimson wool to give added dimension. The backing material is a thick creamy white felt, as always hand-stitched to the canvas. These table runners measure a generous 36" long by 14" wide. 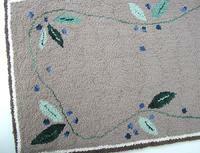 Our Blueberries Table Runner features leaves and berries in variegated shades of blue and green. We picked a rich light taupe for the background color to set off your table and make the berries bluer and the leaves greener. The backing is a double-thick deep cerulean blue--to complement the berries, naturally! This table runner measures an extra-long 48" by 14" wide. 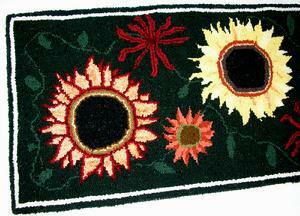 Sunflower Table Runner 36 x 14 in. 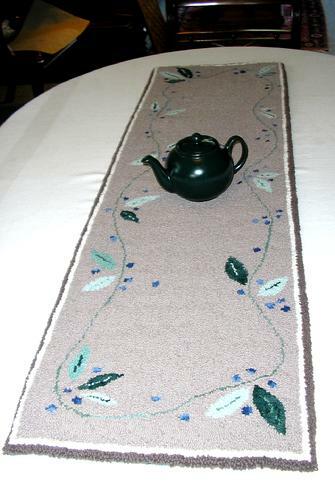 Holly and Ivy Table Runner--36 x 14 in. 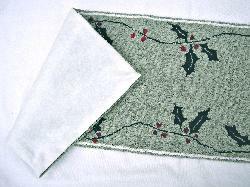 Holly and Ivy Table Runner - 36 x 14 in. Blueberry Table Runner--48 x 14 in. With so many blues and greens, we decided to include extra photos below!